Online Examination System developed in PHP and MySQL - Free download of Readymade Complete Live Project Source Code in PHP Script, MySQL Dabase script, Synopsis, Project Report for final year college student, project submission of PGDIT, BSC-IT, BCA, MCA, MBA, IGNOU, SMU, DOEACC. Download Includes Project Abstract Synopsis, Project Report, Demo, Flow Chart, DFD, Data Dictionary, Requirement Analysis, SRS, Flow Chart, Documentation. Online examination system developed in PHP and MySQL, It contains more than 25 php script file and my sql database scripts. 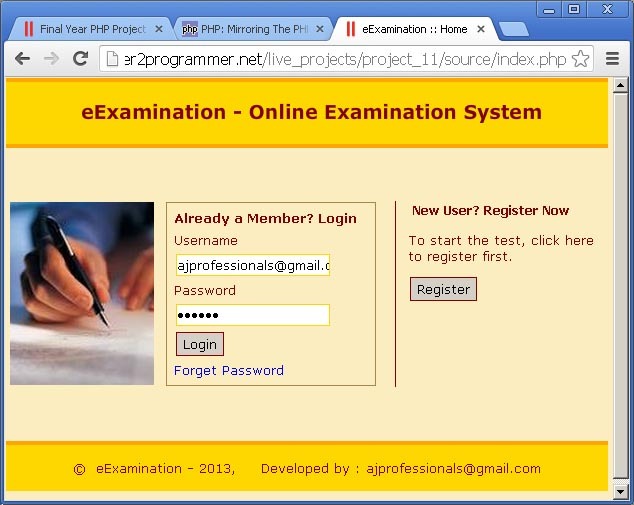 Online examination system is an web based application to conduct examination online. It has modules like question bank, examination, test setup, giving examination, calculate results, view results, store test data. administrator module to manage examination, questions and its options. You can free download of this PHP project with complete documentation, project source code .php files, MySQL database file and installation guide from download link. Code are well commented for your reference, however if you want any clarification you can contact me for further explanation, click here to view online demo of this application. The Online Examination System is easy to use, full-featured and flexible Testing, Examination and Assessment web portal. It allows Administrators to set different examination and question banks for registered students and members. The eExamination System provides complete functionality of evaluating and assessing student's performance skills. The eExamination System comprises of Question Bank effectively blended with a whole set of Features. Using different features of the Examination System an administrator can set an exam name, select an examination, and assign questions for examination. The question bank will form the database of the automated process and will play an important role in random generation of unique sets of question papers. The more the number of questions the better randomization is achieved. Home – Home page of Online Examination site. Login – Student can login to start test. Register – From this page new student can register for test. Student Page – Previously saved test results can be viewed here and other links like Edit Profile, Logout, and Change Password. Change Password – Currently logged user can change his password from this link. Logout – User logged out from this site. Examination – Selection of available examination. Test – System randomly select questions from question bank and display one by one to the student. Results – After completing the examination student can view results. Question Bank - Admin user can manage question bank from web interface. Download Online Examination System for Final Year Student developed in PHP + MYSQL project documentation, source code, DB and project report files. Click here to view the online demo of the application running in PHP and MySQL.